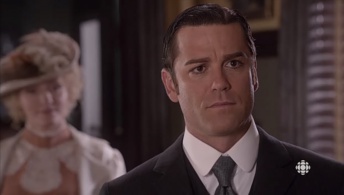 A Study in Sherlock is the 4th episode of season 6 of the Canadian TV series Murdoch Mysteries produced by Shaftesbury Films / Granada International aired on 28 january 2013. 42 minutes. 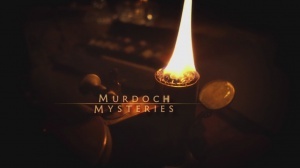 The title of the episode is a reference to the Conan Doyle's A Study in Scarlet. 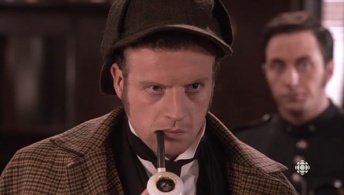 Sherlock Holmes is played by Andrew Gower, but he is in fact David Kingsley an insane young man pretending to be the detective. He yells « Elementary my dear Crabtree! » to the policeman. The diamond is hidden in a miniature boat called "Sunrise", renamed "Aurora" by the fake Sherlock Holmes as a reference to the Conan Doyle's novel The Sign of Four. 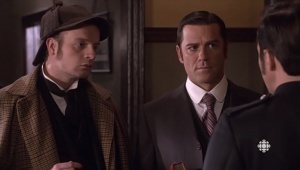 The fake Sherlock Holmes is persuaded that Moriarty is in activity in Toronto. Sebastian Moran is the accomplice of the fake Sherlock Holmes' uncle. 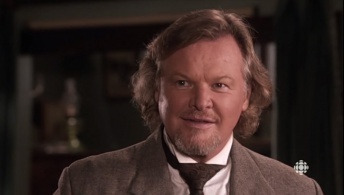 He has long hair and almost no mustache (which never happened to the real Conan Doyle). 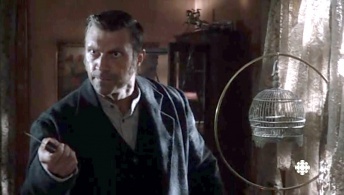 As the episode takes place between The Final Problem and The Empty House, the fake Sherlock Holmes invents how he survived the fight with Moriarty (the head Llama, Khalifa at Khartoum and Sebastian Moran...) which would inspire Conan Doyle for the return of Sherlock Holmes. After a robber is murdered by his accomplice during a heist, Murdoch's prime suspect is an incredibly perceptive man who claims to be Sherlock Holmes. Conan Doyle make a brief return appearance in order to convince this fake Sherlock Holmes that he can't be what he pretends. This page was last edited on 26 July 2015, at 20:39.